Try the sample version of our ureka footcare creams, forming a complete solution to maintain healthy feet. Urea is an important component of the body's natural moisturising factor (NMF) and is well known for keeping the skin revitalised and supple. Free Poster when you buy 6+ Ureka Footcare Creams. Click the add to basket button. 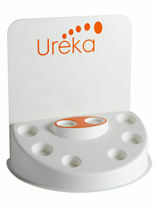 NEW DESIGN - Click the add to basket button to receive your free Ureka leaflets in the post. 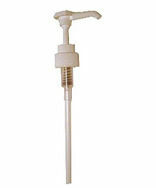 Pump head for Ureka 500ml refill. Ureka foot cream is formulated to care for and hydrate the most severe cases of dry skin. The foot cream contains at least 25% urea in a highly concentrated moisturising and emollient base. A soothing foot cream formulated to control dry cracked skin. The foot cream contains at least 10% urea as a concentrated moisturising and emollient base. Promotes regeneration and smooth, soft skin. Keeps the skin supple and helps prevent further problems developing. Tea tree oil has natural disinfecting abilities. Ureka Tea Tree Footcare Cream contains 100% natural tea tree oil and soothing calendula. Odour preventing calendula is an intense moisturiser and will help provide smooth and soft skin. A soothing foot cream formulated to control dry cracked skin. The foot cream contains at least 10% urea as a concentrated moisturising and emollient base. Promotes regeneration and smooth, soft skin. Keeps the skin supple and helps prevent further problems developing. Ureka 10% Urea Footcare Cream has anti-bacterial and antiseptic qualities. Special counter display for Ureka products. NB NOT SUPPLIED WITH ANY PRODUCTS. Special introductory offer. Starter pack contains: 1 x display (worth 30.00 pounds) see below for contents of pack. Total value: £55.40 + VAT.